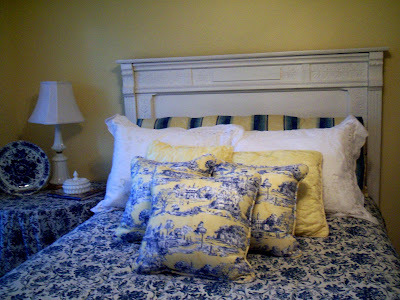 Having missed the Toile Party so many bloggers attended, I decided to post some photos of the yellow and blue toile I have around my house. This isn't rocket science or world peace, but I realized I have a problem that I hadn't noticed before I took this photo with my trusty Kodak EasyShare. White milk glass lamp grouping on side table- seems small and out of scale-I am going to blame the camera. Oh well, rearranging this room was not on my to do list this week. Do you know what I mean? I mean how does this all get started? This guest room came together originally because I already had the Ralph Lauren comforter and a remnant of the same fabric for a side table. I found the soft yellow ginger jar on one of my jaunts, and the grouping below was born. I also liked the way the soft yellow looks against my favorite Sherwin Williams Banana Cream (previous post) . I used the fabric below as a background for a post on an estate sale find. Even though its a little busy, I like the way the silver looks on top of it. However ,it is just right all by itself. Good grief, that didn't sound like baby talk did it? And finally a lamp I found at a garage sale one Saturday morning. I actually got a pair. For those who understand, I am a house person. There is a little blip of peace or satisfaction when I turn a corner in my house and see some of these things. That could impact world peace, right? Thanks for stopping by!! Foxgloves,Fabric and Folly hosts some fabulous swaps. I follow her and have some links through my swap posts. If you like when I find a cool swap I could forward the info to you. That is how I got another friend of mine doing them. They are a lot of fun. Have a super day! Gosh that silver looks gorgeous all piled up there. What a cute little blog you have here! love your toile!! and what an amazing lamp find! Love these!! we are having a whole linky party next Tuesday for trash-to-treasure! You would have a most fabulous post from all your amazing finds!! Hi there! Thanks for stopping by my place. I'm Rechelle, so happy to "meet" you. I love your toile and I'm one that believes things don't have to match to "work" together. If it makes you happy that's all that really matters, right? 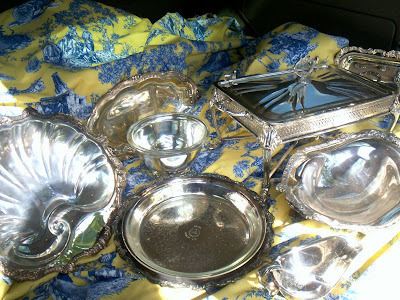 Personally I love the silver on the toile...Oh! Love those lamps! What a great find! Those are great lamps you found! 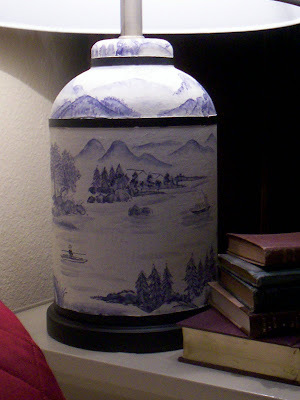 Love the toile! Love your toile! Everything looks beautiful. I'm new to your blog and I'm definately enjoying it! Hi there from another fellow Texas Blogger! I just popped over from The Crowned Casa and am enjoying looking at your blog. Your blue and yellow toile is so pretty! Oh, so inspirational! I am so glad you introduced me to your beautiful blog- I have enjoyed everything and will be back soon! Hello and thanks for inviting me over to visit your blog. I am quite new to this world as well. 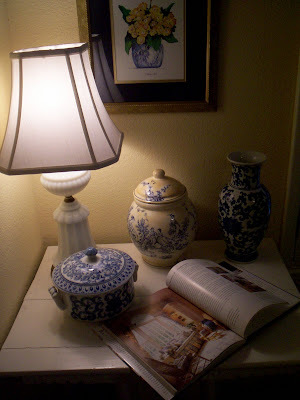 I love your blue and white as well as all your lovely transferware and toile. Oh and I for one do not think your plate or your striped pillow are too dark. You always need some contrast for interest! I joined your followers list so I can stop by often.